It's been a while.....(Isn't that the name of an old grunge song from back in the day? I think by Stain'd?) Late 90's early 2000? Something like that. Anywho, it has been a long time since I have done a MPM or a blog post for that matter. What the heck happened, where did I go? Umm, I have no clue and nowhere. Life just kinda happened and really didn't have the time, motivation or desire to blog. But I am here, still kickin', just doing other things. I do want to get back into blogging. I miss it. I miss you, the readers. I had a good following there for a while. I need to get back on track. 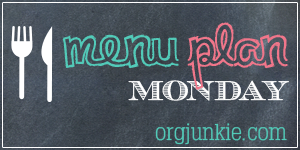 Anywho, for now I am going to do a Menu Plan Monday since I planned meals for this week! Woot! Woot! What's on your menu this week? I am linking up with I'm An Organizing Junkie because that site is ahhhsome. Need some dinner ideas, check it out.